For exquisite biofield support and enhancement, this coin may be worn in either pocket (on the right or left side of the body) or may be worn as a pendant (by placing a chain or cord through the cen­tral oval in the coin) and then wearing it around your neck. Some people have chosen to wear two Prosperity Coins, one in each pocket on both sides of their body. The Prosperity Coin is the result of years of trial and error to find the best device for exquisite biofield support in today’s frequency satu­rated environment. The Prosperity Coin is truly a beautiful, 100% precious metal coin designed to elegantly support and enhance your biofield – like no other device. The coin’s base is made of 99.999% pure silver which is then layered with genuine 24k gold. The coin has a unique design: a circular periphery with a clear-cut oval in the center, based on superior geometric harmonics. It is a coin with su­perior Vastu energetics, thus allowing all four biofield polarities test on with vigor. On one side of the coin are the words imprinted into the coin’s exte­rior facing: Health, Success and Prosperity. On the other side of the coin, the “alpha dot” symbol (an important Vastu symbol) has been carefully etched into the exterior facing. Recommended Use: For exquisite biofield support and enhancement, this coin may be worn in either pocket (on the right or left side of the body) or may be worn as a pendant (by placing a chain or cord through the cen­tral oval in the coin) and then wearing it around your neck. 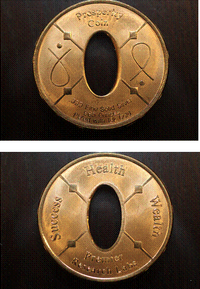 Some people have chosen to wear two Prosperity Coins, one in each pocket on both sides of their body. Many people also love to wear this coin to bed with them at night to continue its biofield enhancement all night long. The coin comes with a beautiful golden thread bag. It is recommended keep the coin in this bag at all times to protect against objects in your pocket from rubbing against it and/or to protect the exterior gold layer­ing from wearing thin. It is recommended to avoid handling the coin too much (to eliminate touching it with the oils naturally present in your skin). However, if you choose to wear the Prosperity Coin as a pendant, please feel free to allow its power and beauty to radiate out from against your skin – and simply don’t worry too much about handling it. Please enjoy its ben­eficial properties and may you prosper for many years to come.